Lest anyone think keeping chickens is all glossy photo-ops with darling hens, and fresh eggs, I present: Le Muck! Nothing brings the realities of keeping chickens and goats to light like mucking out the run after a big storm! The ground is slick, thick, slippery and mucky, and the goats nearby bleat plaintively, "Why? Why did water fall from the sky, why? Why is the ground squishy and damp?" Because nothing breaks a goat's heart like water falling from the sky. Poor goats. The chickens, on the other hand, are heedless things, with no concern at all about rain, mud, or muck. 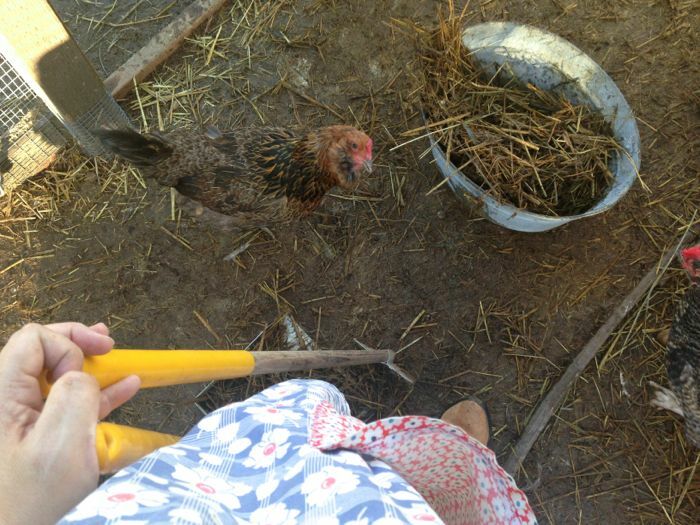 The chickens see opportunity... things get uncovered, and discovered when I am in the run with my rakes and boots, and they follow me, eager to see what comes out. They scratch, and peck, and coo contentedly. The compost pile grows, old trees get mulched. Then comes fresh straw, and the goats investigate, happy for the dry spots I've laid before them, and the hens go wild. I used to lay down the straw and decoratively spread it about, until I realized that's a chicken's job! They are experts at spreading straw, and it's a task they love very much. With more storms lined up for this week, I'll be deep in le muck again, soon. 1. We enjoyed a spontaneous and productive Arduino play event this week. We love doing things with our Young Makers Club, Love & Rockets :: Art & Engineering. 2. All that rain that came over the weekend! And more on the way! Goats may not be impressed, but it's pure joy for us drought stricken folks. 3. Cough drops, tissues, soup, socks, and naps... okay, I am reaching, here. A bug has settled in, making some of us miserable. I guess without small comforts, it could be worse. 4. Boots. I love boots. Sunny days, rainy days, mucky days... boots give you what it takes to face the job, or just kick up your heels! 5. Texting with my girlfriends. Staying in touch, sharing news, finding help... laughing! Maria just came downstairs, covering her eyes, and woefully announcing "I think this must be the headache Alex had, because it hurts so much!" She has the fever, too. Not sure what's made her more sad, being sick, or missing her Winter Concert. More soup! More cough drops! More socks, tissues, and naps! But please, no more bugs! I hope you find the good things in your Monday. We try. We are now able to free range our chickens at our new home and it makes life so much easier! The small space they used to have access to got so mucky - I feel for you - it has lightened our load in chicken maintenance duties with them free ranging now. Of course, the inside of the coop still needs to get cleaned regularly, but no more run... Of course, when the fox or bird of prey gets them, I will wish I still had that enclosed chicken run to muck out! I hope people feel better in your house soon! Free range! Such a great opportunity. We can let them enjoyed some semi-free ranging, but like you, we have predators, so the run is a life saver! Isn't it great watching chickens on the run, free and happy? Thank you for the well wishes. Your descriptive words about cleaning up the muck after the rain really made me smile. I love how you catch the beauty of it . . . beauty in the ordinary and yes, even in the mucky . . . the way the goats hate rain and the hens spread the hay. Of course, I'm not the one there standing in it all with the rake and the pail, maybe it's not quite so beautiful to you! But good things come of it anyway.